This week, I got the Black Panther trade paperback. I've been following Ta-Nehisi Coates's recent run on the series, and the release of this paperback gives me a reason to go re-read all four issues. I'm now also motivated to go re-read Black Panther (#1-6) authored by Reginald Hudlin. The character first appeared in 1966, and took on a starring role in 1973. Hudlin began his run on Black Panther in 2005. 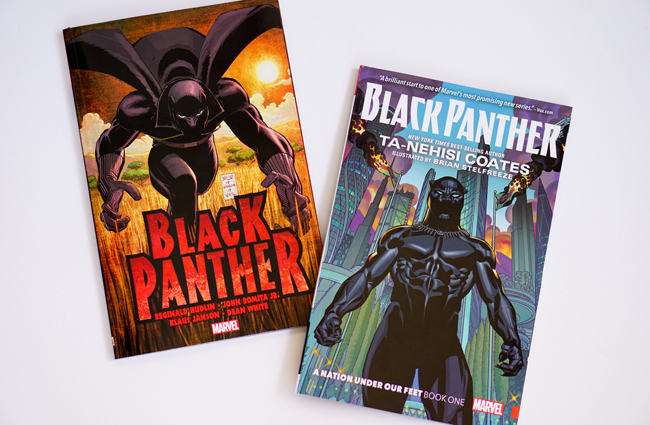 In April of this year, Coates began writing Black Panther. I first came to the works Hudlin and Coates in various other mediums. Hudlin had worked as a filmmaker, and Coates worked as a journalist. I'll try to keep their creative backgrounds in mind as I re-read their different takes on Black Panther.